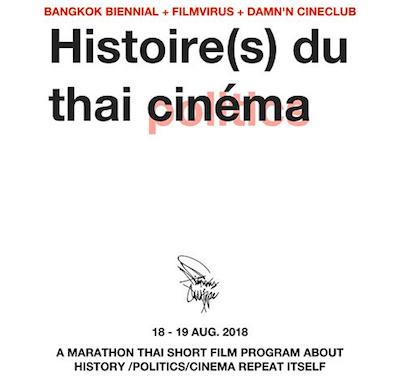 Histoire(s) du thai cinéma, a marathon programme of Thai short films with political themes, took place over a weekend at Bangkok's Dam'n Cineclub earlier this year. The event, split into two twelve-hour sessions (18th and 19th August), was curated by Wiwat Lertwiwatwongsa. The selected films covered Thai politics since the democratic revolution eighty years ago. The Six Principles (สัญญาของผู้มาก่อนกาล), directed by Abhichon Rattanabhayon, examines contemporary public perceptions of the 1932 revolution. Octoblur (ลมตุลาคม), directed by Patana Chirawong, intercuts footage of the 14th October 1973 massacre with the funeral of Thanom Kittikachorn, the military dictator who ordered the attack. Suchart Sawasdsri's "Red" at Last (มนัส เศียรสิงห์) and Manussak Dokmai's Don't Forget Me (อย่าลืมฉัน) both include footage of the 6th October 1976 massacre: "Red" at Last is narrated by a survivor of the tragedy, while Don't Forget Me features incongruous narration taken from a vintage documentary on the Mlabri tribe. Thailand's recent political polarisation was represented by films examining the PAD, UDD, and PDRC protests. In Prap Boonpan's The Bangkok Bourgeois Party (ความลักลั่นของงานรื่นเริง), a group of yellow-shirted Bangkokians murder a man merely because he disagrees with their ideology. (This dystopian satire later became a reality, when PAD guards killed Narongsak Krobtaisong.) The UDD movement is featured in Red Movie (แกะแดง), directed by the Underground Office collective, which ends somewhat idealistically with John Lennon's utopian song Imagine. PDRC demonstrations appear in Boonyarit Wiangnon's Lice in the Wonderland (เพลี้ย) and two films by Chulayarnnon Siriphol: Here Comes the Democrat Party (ประชาธิปัตย์มาแล้ว) and Myth of Modernity. The films with the most powerful impact were Nil Paksnavin's Rajprasong (ราชประสงค์), Nontawat Numbenchapol's Gaze and Hear (สายตา รับฟัง), and Re-presentation (ผีมะขาม ไพร่ฟ้า ประชาธิปไตย ในคืนที่ลมพัดหวน) by Chai Chaiyachit and Chisanucha Kongwailap. Rajprasong ends with a black screen and the jolting sound of eighty-seven gunshots, representing the victims of the 2010 massacre in downtown Bangkok. Gaze and Hear is a parody of royalist propaganda, with a hypnotic voiceover and flashing lights inducing a trance-like state of obedience. Re-presentation ends with an artist unsuccessfully attempting to draw Democracy Monument, and tearing up his sketch to reveal a drawing of a Rama V statue on the page beneath, a reference to the established hierarchies underlying Thailand's elusive democracy. BNK44, the anti-coup punk concert that was cancelled last month, has been rescheduled to 3rd November. 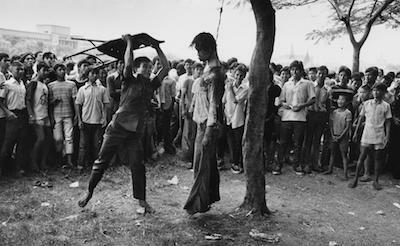 It will now be held at Thammasat University's monument to the 6th October 1976 massacre. The concert has been organised by the team behind จะ4ปีแล้วนะ. Suthachai Yimprasert's Different Views, Death Sentence [sic.] (ต่างความคิด ผิดถึงตาย ๖ ตุลาคม ๒๕๑๙) was released on DVD in 2011. 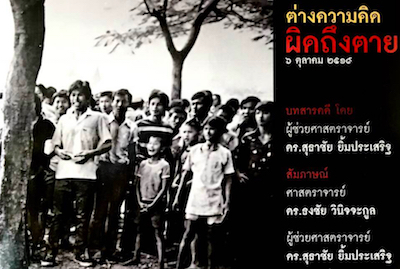 The documentary explores the long-term issues that led up to the 6th October 1976 massacre at Thammasat University, providing context and analysis missing from Pen-ek Ratanaruang's documentary Paradoxocracy (ประชาธิป'ไทย). Sir Philip Green has been granted an injunction against The Daily Telegraph, preventing the publication of allegations against him. 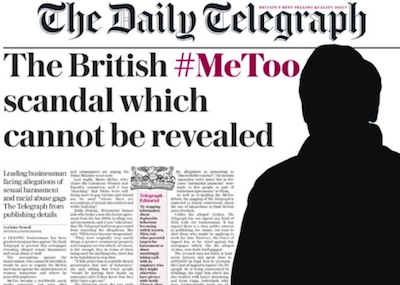 In a front-page article today, Claire Newell reveals that he made payments to five people who accused him of "sexual harassment and racial abuse". Green is not named in the story, and he is described only in general terms as a leading businessman. Under the conditions of the interim Court of Appeal injunction, Green's identity cannot be published in England or Wales. Similar high-profile injunctions in recent years have involved Ryan Giggs (who was named by The Sunday Herald in Scotland) and Elton John (whose injunction remains in force, despite the National Enquirer naming him in the US). 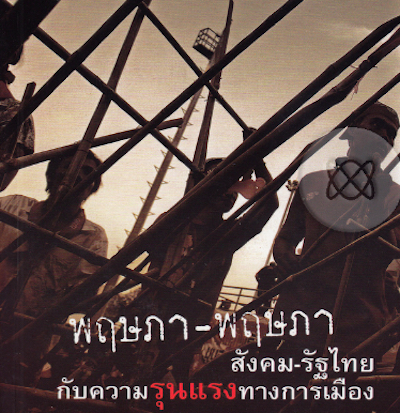 Charnvit Kasetsiri's พฤษภา-พฤษภา: สังคม-รัฐไทย กับความรุนแรงทางการเมือง was published in 2013. The book examines the military massacres of May 1992 and May 2010, including rare reproductions of newspaper coverage from 1992. Charnvit's other books on Thailand's modern history include October 14, 1973 Student Uprising (บันทึกประวัติศาสตร์ 14 ตุลา) and October 1973 to October 1976: A History of State Violence in Thailand (ตุลา-ตุลา: สังคม-รัฐไทย กับความรุนแรงทางการเมือง). พฤษภา-พฤษภา also features a VCD of a documentary (พฤษภาทมิฬ) originally released on VHS in 1992. The documentary is most notable for its subversive soundtrack: footage of soldiers beating protesters is accompanied by an ironic Ad Carabao song (ผู้ทน) praising the government, providing an intentional counterpoint to the massacre footage. 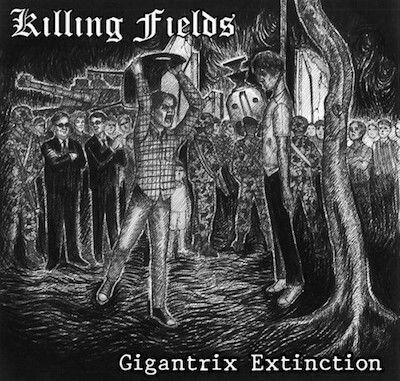 Gigantrix Extension includes the song 6th October, which is about the state-orchestrated killing of students during the 1976 massacre. Earlier this year, Killing Fields performed at จะ4ปีแล้วนะ, a concert marking the four-year anniversary of the 2014 coup. 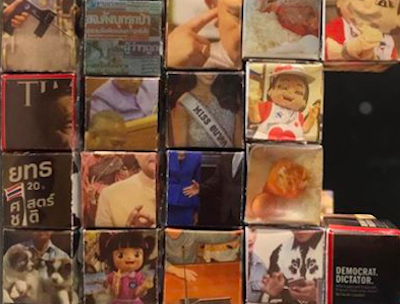 Anocha Suwichakornpong's films Mundane History (เจ้านกกระจอก) and By the Time It Gets Dark (ดาวคะนอง) will be shown at Bangkok's Warehouse 30 this month and next month, at screenings organised by Doc Club Theater. They will play as a double bill on 22nd October and 3rd November, followed by individual screenings on consecutive evenings: By the Time It Gets Dark on 25th October, and Mundane History on 26th October. By the Time It Gets Dark will also be shown on 11th November. 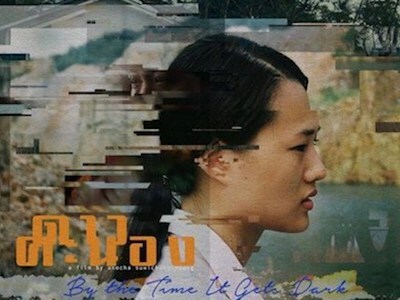 Almost exactly a year ago, a proposed screening of By the Time It Gets Dark at the same venue was inexplicably cancelled by Thai police. 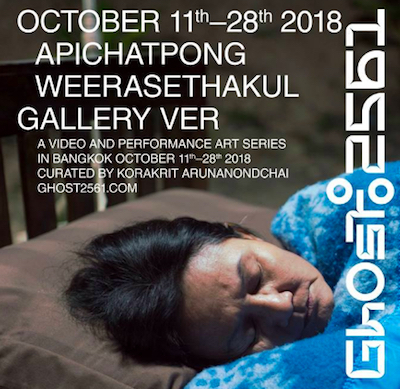 Ghost:2561, a series of video screenings at galleries throughout Bangkok, began yesterday and runs until 28th October. 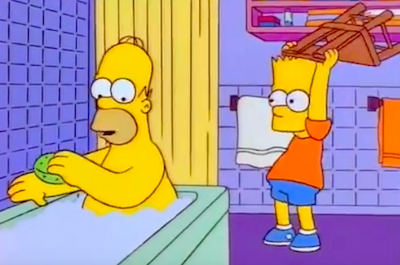 (2561 in the Buddhist calendar equates to 2018 in the Gregorian calendar.) The event includes Blue (ตะวันดับ), a new video by Apichatpong Weerasethakul, in which his muse, Jenjira Pongpas, falls asleep in front of a series of theatrical backdrops. As Jenjira sleeps, a flame appears, and gradually the entire scene becomes engulfed in a blazing fire. The liminality between sleeping, dreaming, and wakefulness is a recurrent theme in Apichatpong's work. He filmed his boyfriend asleep on three consecutive nights for Teem, and Dilbar shows a construction worker sleeping. Sleep is also central to Apichatpong's most recent feature film, Cemetery of Splendour (รักที่ขอนแก่น), and his segment of the new portmanteau film Ten Years Thailand (Song of the City). The fire in Blue has echoes of his Primitive installation project, such as the burning football in Phantoms of Nabua. Blue, showing at Bangkok's Gallery VER, is projected onto a large glass screen, hanging in the centre of the darkened gallery. This produces reflections of the images on the walls and floor, highlighting the film's theatricality and demonstrating Apichatpong's continued fascination with (and mastery of) the effects of light. 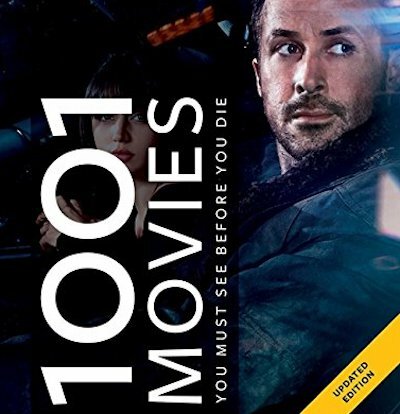 1001 Movies You Must See Before You Die, edited by Steven Jay Schneider, has been revised for 2018. The new edition, updated by Ian Haydn Smith, features eleven new films, and eleven titles have been deleted. 1001 Movies was first published in 2003, and has been updated annually ever since. It was completely revised in 2013, though other editions (2004, 2005, 2006, 2007, 2008, 2009, 2010, 2011, 2012, 2014, 2015, 2016, and 2017) featured only minor changes. The new films in the 2018 edition are: The Handmaiden; Lady Macbeth; Lady Bird; The Shape of Water; Three Billboards Outside Ebbing, Missouri; Call Me by Your Name; Mother! ; Blade Runner 2049; Get Out; and Black Panther. While these choices are all justified though predictable, the documentary Dawson City: Frozen Time is a more surprising addition. The deleted films are: No Man's Land; The Consequences of Love; Tsotsi; Lincoln; The Revenant; Hell or High Water; The Jungle Book (the Jon Favreau version); Jackie; Manchester by the Sea; I, Daniel Blake; and Arrival. retracts it in its entirety..."
The Washington Times has reached an out-of-court settlement with Aaron Rich, after he sued the newspaper for defamation. Rich's brother, Seth, became the subject of a conspiracy theory after his unsolved murder in 2016. It was alleged, without any evidence, that Seth Rich had leaked Democratic National Committee emails to WikiLeaks. 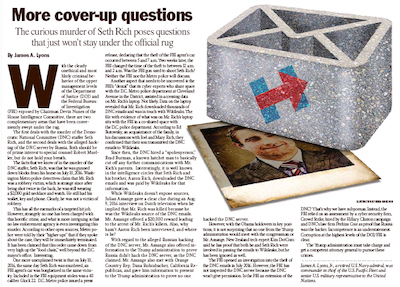 The newspaper has since deleted the article (headlined "More cover-up questions") from its website. It has also issued a retraction, disavowing the op-ed's allegations about the Rich brothers: "The Washington Times now does not have any basis to believe any part of that statement to be true, and The Washington Times retracts it in its entirety." 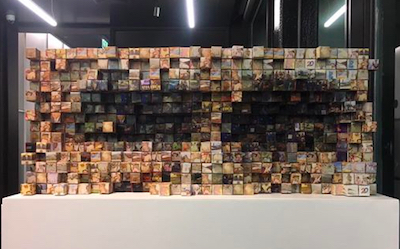 Miti Ruangkritya's Thai Politics III is part of his Thai Politics series inspired by Thai political polarisation. 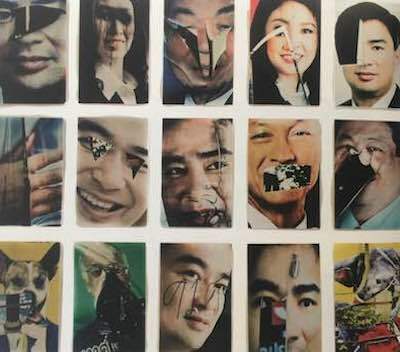 The exhibition catalogue, in an edition of 500 numbered copies (of which mine is number 176), features reproductions of defaced posters from the 2011 election, in which Yingluck Shinawatra defeated Abhisit Vejjajiva. 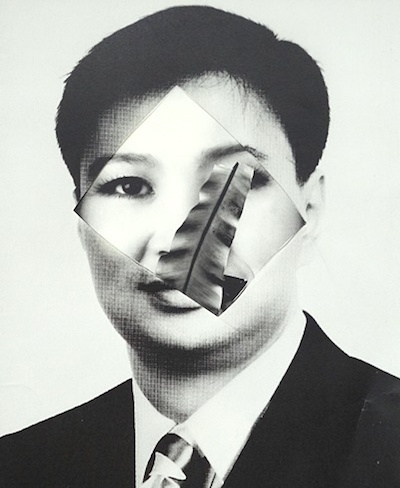 The cover has been die-cut to simulate a slashed poster of Abhisit. 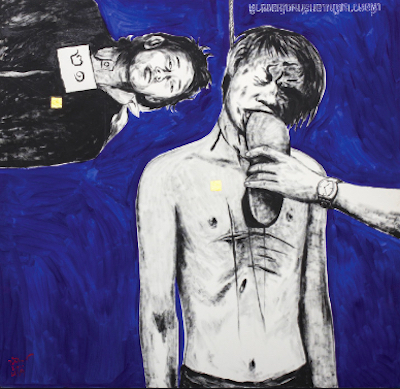 Manit Sriwanichpoom's series The Election of Hatred (การเลือกตั้งแห่งความเกลียดชัง) also featured photographs of defaced 2011 election posters. 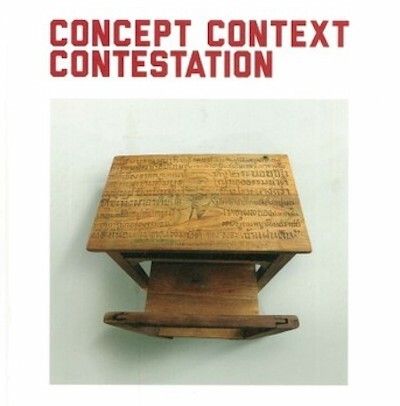 The Concept, Context, Contestation: Art and the Collective in Southeast Asia (มโนทัศน์ บริบท และการต่อต้าน: ศิลปะและส่วนรวมในเอเชียตะวันออกเฉียงใต้) exhibition was held at BACC in 2014. 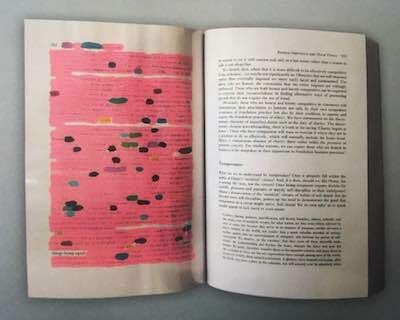 The scholarly exhibition catalogue, edited by Iola Lenzi, features essays on art in Thailand, Myanmar, Indonesia, and the Philippines. 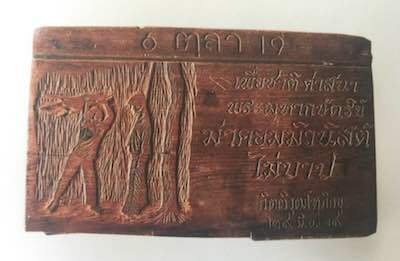 The plates section includes rare reproductions of Vasan Sitthiket's Blue October (ตุลาลัย), recreating photographs of the 1976 Thammasat massacre; Paphonsak Lao-or's Loss of Hearing (สูญเสียการได้ยิน), commenting on lèse-majesté by self-censoring books on page 112; Sutee Kunavichayanont's History Class (ห้องเรียนประวัติศาสตร์), with sensitive historical events carved onto school desks; and Manit Sriwanichpoom's The Election of Hatred (การเลือกตั้งแห่งความเกลียดชัง), defaced 2011 election posters similar to Miti Ruangkritya's Thai Politics III.